Simplicity 1277: Amazing fit dress with bust darts, contrasting side panels and various cup sizes. This wine/cream printed cotton-poly immediately caught my eye as I was making my way to the back of 123 Fabrics in Bklyn. It just appeared to shine brighter than the other printed fabrics standing side by side and trying their darnedest to bid for my attention. The print just dazzled me and knew a cut of it would be coming home with me. Once home with this cut and a few others, I pondered how could I best show case this fabulous print without it being too much. Over a few days and as I played Russian roulette with my patterns, Simplicity 1277 struck me as the one. I cut a size 16D for the body & armhole, 14 @ the neckline & shoulders. 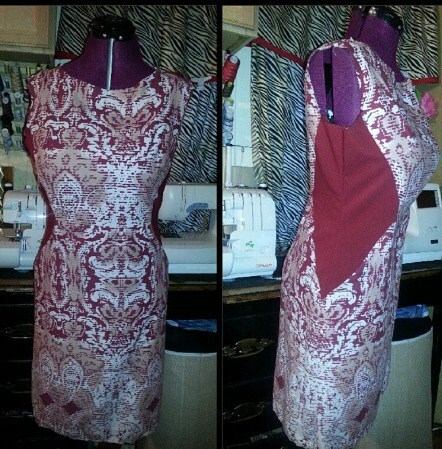 I made adjustments to the side seams (3/8"), center back (1/4") omitting the zipper and scooped the front neckline. However the neckline did not end up as low as I would've liked, because I removed 1/4" from the shoulder seams.... totally forgetting to go back and scooping a tad bit more from the front neckline. For the side panel/pockets I used a wine stretch woven. The construction was going smoothly and then, a moment ... make it 20 minutes of befuddlement with the pocket construction. There is the pocket facing, which the instructions have you attach to the dress, and then there is the side panel with the cut-on pocket in which you are to attach the pocket right sides together to the facing. Well that was not working, I must have flipped that piece several times, then gave in and found it easier to attached the upper part of the side panel, then attach the pocket to the pocket facing... worked like a charm. I top stitched along the front and back side panels. Despite the lil befuddlement with the pocket construction, the pocket location is perfect, wherein if side seam adjustments are needed they are not in the way. The dress is more along the style of an A-line silhouette and went back before inserting a full lining and removed from just below the pocket another 3/8" from the side seams. Thinking I could've removed a tad more. Also added front & back neck darts to remove the excess. I fully lined the dress with black tricot, however instead of fiddling with the pattern pieces, once the front and back were completed and before attaching at the side seams. 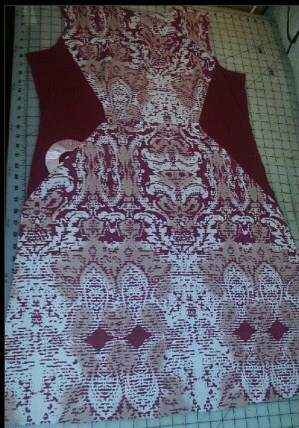 I traced off a lining from the front and back pieces of the dress and added 3/8" seam allowances. I will definitely make this dress again, but will go ahead and cut the pattern 14 size and as well as the next smaller size for the neckline & shoulders. Love the color block style. Very nice. Another winner. I especially like it with the jacket. You did a fabulous job with dress. Another winner. Thank you Anonymous. .. one of my family nicknames is Linus... the call my blazers a blanket. I love me some blazers. Thank you Alethia. ... I am so smitten with the print and oh how I wish there were other colors. That is a gorgeous color combination Sheila. And just like the pattern says - an amazing fit! Great looking dress!! The print fabric is very pretty and love the solid inset. Great job as usual! Thank you Faye and yes an amazing fit. Wondering what took me so long to sew it up.. Thank you Linda. The fabric was perfect for this dress. This is an interesting print that works well with your solid fabric. It's lovely with or without the jacket. I can see why that fabric stood out to you. The way you paired it with the solid color fabric with that pattern is perfect. Thank you Dorothy, its definitely interesting, but o' so pretty. Love these two fabrics together! Nothing like a cute dress to bounce around in! Thank you Terri. I would love to make another one. I always get inspired when I view your page. Your fabric selections are so nice! Sheila were you a model in another life, lol ! Awww ... Thank you Sharon. A model in another .. lol I wish.. Thank you though.